NEW YORK--(BUSINESS WIRE)--Momofuku, the restaurant group founded by chef David Chang, announces that Ssäm Sauce will be available nationwide for the first time. Variations of Ssäm Sauce have been a staple in the pantry of Momofuku kitchens since the opening of Momofuku Noodle Bar in 2004. The original Ssäm Sauce combines gochujang, a traditional, umami-rich Korean chili paste, with miso, sake, soy sauce, and rice vinegar. The spiciness of the Korean chilies is balanced for a subtle heat that adds a tangy and complex flavor to anything—noodles, burgers, pizza, fries, sandwiches and everything in between. Starting today, Original Ssäm Sauce will be available alongside two new versatile flavors, Smoky and Spicy, on Amazon.com. In the new Smoky flavor, BBQ meets Korean chilies in a tangy sauce that is the perfect balance of spicy, smoky, and sweet. The new Spicy flavor takes the heat up a notch and adds a kick to everything from fried chicken to tacos to egg sandwiches. 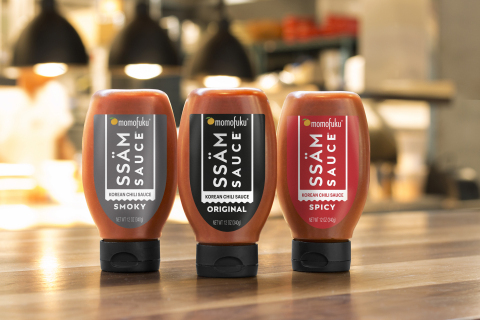 Momofuku partnered with Springboard, a new platform from Kraft Heinz dedicated to accelerating the growth of disruptive brands within the food and beverage space, to bring Ssäm Sauce to retail nationwide. Momofuku’s Culinary Lab collaborated closely with Springboard to scale up the original Ssäm Sauce recipe for national distribution and to develop the new Smoky and Spicy flavors. This project is Springboard’s first partnership and foray into the specialty culinary world since launching in March 2018. All three flavors of Momofuku Ssäm Sauce will be available at Amazon.com beginning April 18th. Consumers are encouraged to share Ssäm Sauce on their favorite foods on social media by using #goodoneverything. For more information visit www.momofuku.com. Momofuku was founded by chef David Chang in 2004 with the opening of Momofuku Noodle Bar in New York City. Credited with “the rise of contemporary Asian-American cuisine” by the New York Times and named the “most important restaurant in America” by Bon Appétit magazine, Momofuku has opened restaurants in the United States, Australia, and Canada. The restaurants have gained worldwide recognition for their innovative take on cuisine, while supporting sustainable and responsible farmers and food purveyors. Momofuku Ko has two Michelin stars, which it has retained for nine years and is featured on the S.Pellegrino World's Best Restaurants list.